The Cost of Freedom is Vigilance! And Vigilant Always...We Must Remain! -Let each and everyone of us take this very moment to pray for the safety of our troopsin harms way tonight or today as we read this. Pray for those brave men and women who place themselvesat risk so that we may be free to enjoy that Freedom. 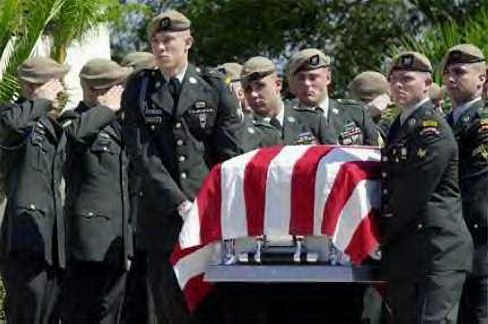 Let us pray for those brave souls who lost theirlives during all of America's armed combats at home and abroad. But let no individual or nation or group or organization misunderstand our prayers as a sign of weakness. America desires peace but as a people our nation is a sleeping giant and once awakened we shall rise up for the cause of justice and pursue those who would see freedom destroyed; Let us pray that we do not have to make that decision lightly; but, if America does...let us pray that our aim is ever true and that our efforts shall last but a short time to restore order to the world. And that it is the soldier, sailor, marine and airman who detest war the most and who are called upon generation after generation to pay the greatest cost. A Grateful Nation says Thank You. May God Give Rest to the Souls of fallen Heroes and Comfort to their families.
" On a Great Warrior... "
The Great Occasion's mighty peer. He Smote armed opposition down. He bade the storm and darkness cease. Shone out the smiling sun of peace. A Silent man in friendship true. He made point-blank his certain aim.